“In doing so, she won a record eight U.S. women’s singles titles and became the only woman—along with Chris Evert—to hold four of them consecutively. 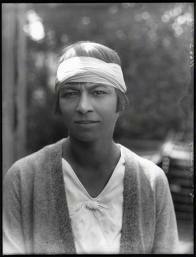 And her win in 1926, at the age of 42, established her as the oldest singles Grand Slam champion in history. When Bjurstedt—Mallory, as she was to become in 1919—first arrived in the United States in 1915, she had already won an Olympic bronze medal, but she was still a complete unknown. That was until she beat three-time defending champion Marie Wagner in straight sets to take the first of five singles titles at the national indoor championships. That same year, she won the first of her eight Grand Slam titles. What made Mallory stand out from the rest—and she beat a different woman in each of her eight Slam finals—was her attitude and her style of play. It’s no surprise that she was regarded as a fierce competitor. Even at 42, in that 1926 match against Elizabeth Ryan, Mallory fought back from a 0-4 final set deficit to win the U.S. title 4-6, 6-4, 9-7. But she was also described as “running with limitless endurance,” and as using a powerful baseline game and strong forehand to run her opponents into the ground. It’s worth putting this into the context of her day. Mallory, along with her most renowned contemporary on the other side of the Atlantic, Suzanne Lenglen, entered a world of female competition where long skirts, long sleeves, and even boned corsets, were the order of the day. But to play the kind of tennis that these new heroines of the game brought to the court needed change. 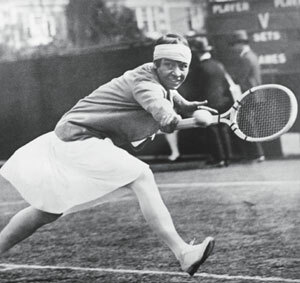 Lenglen is credited with shocking European audiences—notably Wimbledon—with her calf-length, loose fitting attire, but Mallory was wearing exactly the same in the States. This enabled her to play as she wanted rather than as women were expected. It’s not difficult to extrapolate that same spirit to some of the most successful and inspirational women to play the game in our own era: Billie Jean King, Martina Navratilova, and the Williams sisters. Though other modern-day champions such as Steffi Graf and Chris Evert may claim a greater inheritance from the elegant and balletic style of Mallory’s antithesis, Lenglen, they can also trace contemporary attitudes to fitness, speed and attack back to the Norwegian. Mallory’s tennis career ended at 45, as a semi-finalist at her beloved Forest Hills. 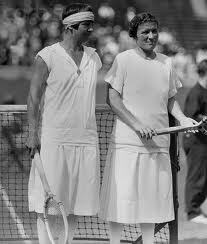 By that time, she had played in every U.S. Open between 1915 and 1929. Not content with winning eight of them, she was a finalist in two more, a semi-finalist in three and—her worst result—a quarter-finalist in 1927. Mallory was also a fixture in the mixed doubles between 1915 and 1924, winning three times (twice with Bill Tilden), and being runner-up five times (again twice with Tilden). Add another pair of titles in the women’s doubles and Mallory boasts 13 American titles. At this point, some historical context is again revealing. The U.S. tournament was the only Grand Slam to continue through the First World War, and so Mallory did not make an assault on the European events until 1920. By then, at 34 years of age, she could reasonably be considered to be past her physical peak, and so her success against a new generation of more liberated players was limited. She nevertheless reached one final, two semis, and two quarters at Wimbledon, and reached the final of the French at her first attempt, never having played on clay before. It seems surprising, then, in the light of this woman’s extraordinary contribution to women’s tennis, that her name and achievements have not stood alongside those of her glamorous French counterpart. Almost every reference to Lenglen ascribes to her a turning point in women’s tennis. She was undoubtedly one of the most gifted players of her era, and a beautiful and agile exponent of the game. She was also flamboyant, given to emotional tears, and had the glamour to draw French and British crowds in never-before-seen numbers. However, she made just one visit to the U.S. Open, and exited in the second round. Her career ended in 1926. In a reversal of their early fame, though, Mallory was inducted into the International Tennis Hall of Fame in 1958, one year before she died, aged 75, but a full 20 years before her more famous contemporary. Lenglen was not inducted until 1978, a full 40 years after her premature death. And Mallory’s recognition has more recently had another boost. Just last year, her name took its place, along with that of Pete Sampras, in the Court of Champions at the Billie Jean King National Tennis Center. At last, Mallory stands shoulder to shoulder with her equals: not only King, Navratilova, Evert, and Graf, but also Don Budge, Maureen Connolly, Margaret Court, Althea Gibson, Jack Kramer, Rod Laver, and Helen Wills. And one more Champion who undoubtedly appreciated Mallory right from the first, from his own personal experience, is also there: former Grand Slam doubles partner, Bill Tilden. But, to make this story complete, one must address the question of her mother. Her photographs would surely give a strong indication that her mother was of African ancestry. You judge for yourself!